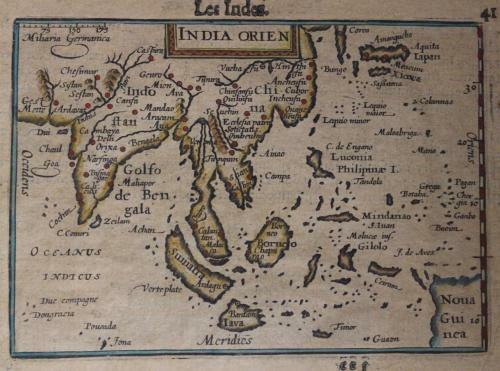 A very rare small map of the East Indies in old / original colour. The map depicts East Indies, Korea, Japan, China, Sri Lanka, Tibet, Bhutan, India and a bit of Papua-New Guinea. French text on the verso. In antiquarian condition with minor overall toning and a couple of small holes in the margin (well away from the printed area). Petrus Bertius was born at Beveren, Flanders, in November 1565. As a refugee, Bertius settled in Amsterdam and, after finishing his studies, he became a professor of mathematics and librarian at the University of Leiden. In 1618 he also became cosmographer and historiographer to Louis XIII of France, and lived in Paris, where he died in October 1629. His fame among geographers was established by his text in the pocket atlas Tabularum Geographicarum.